James Richard "Jimmy" Clausen (born September 21, 1987, in Thousand Oaks, California) is an American football quarterback. He currently attends the University of Notre Dame in his junior year. On December 7, 2009, Clausen announced his decision to skip his final year at Notre Dame and enter the 2010 NFL Draft. Following Notre Dame's opening loss to Georgia Tech in the 2007 season, Clausen was named the starting quarterback, but would win only one of his first six starts (against UCLA) and was replaced by backup quarterback Evan Sharpley during Notre Dame's loss to Boston College on October 13, 2007. Citing non-specific injuries to Clausen (who had been sacked 23 times), head coach Charlie Weis named Sharpley as the starting quarterback for Notre Dame's contest against USC on October 20, 2007. After sitting out Notre Dame's losses to USC and Navy, Clausen was again named the starter for their contest against Air Force. During his sophomore season, he completed 60.9% of his passes for 3172 yards, 25 touchdowns and 17 interceptions and a 132.5 efficiency rating which places him as the 44th ranked QB in Division 1-A football. He led the Fighting Irish to a 7-6 record, culminating in a 49-21 victory against Hawaii in the Sheraton Hawai'i Bowl — which ended Notre Dame's NCAA-record nine-game bowl losing streak. Clausen set Notre Dame bowl records with 406 yards passing and five touchdowns and was named the bowl's co-MVP. In October 2009, Clausen was named midseason All-American by The Sporting News. His finished the season with 3,722 yards passing, a 68.8% completion rate, 161.42 passer rating, 28 touchdowns, and four interceptions. Clausen was honored several times throughout the 2009 season by the College Football Performance Awards. At the conclusion of the season, he ranked second for the Quarterback Trophy, won by Case Keenum and 7th for the National Performer of the Year Trophy, won by Ryan Mallett. On Monday, December 7 2009, Clausen declared that he would forgo his senior season at Notre Dame and enter the NFL draft. Clausen is scheduled to graduate from Notre Dame in May 2010 with a bachelor of arts degree in sociology. On June 23, 2007, Clausen was cited for illegal transportation of alcohol in South Bend, Indiana. He was driving someone who was of legal drinking age to a liquor store to buy alcohol. According to published reports, Clausen entered a pre-trial diversion program which erased the citation since he stayed out of trouble for the following 12 months. On November 22, 2009, Clausen was involved in an altercation outside of a South Bend pub. Sources indicate that Clausen was there with family and teammates following the team's senior day loss to Connecticut. It was reported that upon his departure, Clausen was punched in the face outside of the pub. A South Bend Police Department spokesperson stated that no police report was filed over that weekend involving Clausen. Reports indicate that Clausen was left with a black eye. A later report of this incident indicated that the other subject involved in this incident allegedly shoved Clausen's girlfriend. It was reported that Clausen then shoved the subject away prior to Clausen being punched. The brother of two former Tennessee Volunteer quarterbacks, Rick and Casey, received a lot of publicity -- as well as national offensive player of the year and All-American awards -- as a star at powerhouse Oaks Christian. He told the media he specifically chose Notre Dame over USC to play for head coach Charlie Weis, a highly successful offensive coordinator with the New England Patriots trying to get the Irish back to national title contention. Once Weis' five-year term in South Bend ended with his firing last December, Clausen found it an easy decision to apply for early entry into the draft. Clausen started nine games as a true freshman, suffering through a tough campaign in which he completed only 56.3 of his passes for 1,254 yards and seven scores against six interceptions. But his leading receiver was TE John Carlson and his offensive line and receiver play was less than stellar. But as he matured and Golden Tate and Michael Floyd stepped up over the next two seasons, his completion percentage (60.9, 68.0), yardage (3,172, 3,722) and touchdowns (25, 28) increased. His most impressive statistical improvement came in cutting his interception totals between his sophomore (17) and junior (four) seasons. Taking care of the ball, despite facing consistent pressure behind an average offensive line, greatly improved his draft stock. With no senior quarterbacks receiving surefire first-round grades, Clausen's skill set will be coveted. His experience in a pro-style offense, poise and fiery leadership most coaches like, although he'll need to control those emotions to be successful early in his NFL career. If able to do that, there's no reason to believe he won't be a very high pick and long-time starter at the next level. Accuracy: Very good, but not great, accuracy on short-to-intermediate throws whether over the middle or on the sidelines. Receivers usually have a chance to run after the catch, though he tends to throw high when missing because of his delivery. Fades are generally placed where only his receiver can make the catch, though not always over the correct shoulder. Needs to consistently put deep throws on the outside shoulder of his receiver. Arm Strength: Enough arm strength to make every necessary NFL throw, but requires great effort to do so. Good zip on crossing or out patterns to either side of the field when in balance. Places in the ball in tight quarters over the middle. Tries to throw too hard at times, and needs to take a bit off short passes and rely on his arm strength to deliver passes without a wind up. His 60-yard deep ball floats, allowing safety help to arrive. Setup/Release: Well-coached pro-style quarterback with balanced footwork and nice ball carriage. Also effective out of shotgun. Puts strong effort into each pass, sometimes overthrowing. Winds up a bit when trying to unleash a fastball, allowing defenders to react. Drops right shoulder to get better trajectory on deep passes. Needs to better sell ball fake and pump fake to draw in defenders. Able to deliver the ball from different slots when needed, but also gets happy feet if line is struggling to protect him and will throw off back foot. His average height and tendency to wind up could hinder ability to get the ball through the line. Reading Defenses: Regularly looks off safety before going to his intermediate or deep out. Tended to bird-dog his favorite receiver in 2009, however. Takes too many chances downfield, eschewing his underneath options and trusting his receivers but not acknowledging safety help over the top. Also throws late over the middle or across his body, which he won't get away with in the pros. On the Move: Good footwork in the pocket, able to shift in any direction to evade rushers and create space and find a passing lane in which to throw. Keeps eyes downfield when pressured out of the pocket, and throws well running to his left or right. Able to run for first downs. Adept at sliding after a run but gives good effort to gain a first down or find the end zone. Needs to secure the ball better when scrambling. A bit late feeling backside pressure, but his internal clock improved this year behind a below-average line. Intangibles: Fiery, emotional leader is willing to demand the best from his teammates. Intelligent player able to handle any offense. Tough runner who played through broken toe on his plant (right) foot in 2009. Maturity has been a question mark in the past, and he can get salty with coaches and teammates during a game, but no major concerns have arisen. The true leader in this year’s class of quarterbacks. What separates him from the rest is his experience in playing under center. While most perennial college powerhouses employ the spread offense, Clausen has excelled in Notre Dame’s West Coast. McCoy [sic] has progressed nicely throughout his college career and now possesses all the necessary tools to be a success in the NFL. He still needs to refine his footwork, as well as work on setting his feet before he throws, but he does a solid job of throwing the ball on the run. His skill-set would work perfectly in a Mike Shanahan offense, as he has excellent fluidity and a nice zip on his ball. He doesn’t have the biggest arm in the world, but he can make all the necessary throws, and has the experience to step into a system and be effective from day one. With all due respect to Oklahoma's Sam Bradford, the Fighting Irish's Jimmy Clausen has established himself as the best pocket passer in this draft. A highly touted high school player, the 6-foot-2 passer took the Notre Dame starting QB job in the second game of his true freshman year and never looked back. Clausen started nine games in 2007, throwing for 1,254 yards with a 56.3 completition percentage (138-245) and a 7-6 touchdown-interception ratio. The numbers are not mind-boggling, but put them with a visibly weak offensive line, a lackluster running attack and almost no speed outside, and they are a testament to his ability. Clausen had a breakthrough sophomore campaign in 2008, when he passed for 3,172 yards, completing 60.9% (268-440) of his passes with an impressive 25-17 TD/INT ratio. He threw for 3,722 yards with 28 TDs and only 4 interceptions this past year to solidify his status as one of the best signal callers in the country. The best QB prospect in his class. Has a strong arm and is capable of making all throws with zip and accuracy. Has an efficient setup and over the top delivery motion. Typically shows good power and touch on deep balls. Has improved his accuracy significantly during the past two years. Has a pro-style release. Usually definse the defense at the line, making pre-snap adjustments in pass protection. Is a deceptively good athlete. Shows quick footwork when moving in the pocket and consistently moves and slides to avoid sacks. Is very experienced in a pro-style offense set. Though, will have to work on his footwork. If his release is off, he struggles to put velocity on downfield throws. Hasn't produced much on underneath areas. Will scramble for the occasional first down, but can't take off and run for big chunks of yardage. Is not a vocal leader and can be rattled when the pocket collapses. Clausen is the best pure passer the draft has seen since Matt Ryan in 2008 and with more coaching he should develop into a top flight NFL quarterback. He is a sure fire top 5 pick with the real possibility of being the first overall pick. Accuracy: Clausen has the incredible ability to complete just about every pass of 15 yards or less. Puts very good touch and zips on his short and intermediate throws. When his deep pass is on, he leads the receiver well. Needs to improve his trajectory on deep throws. His throws tend to come in low on deeper passes. Can throw on the move well and his passes don't lose a lot of velocity. Completed 68 percent of his passes as a junior. Arm strength: While Clausen's arm is strong enough for the NFL, he can't accurately make all deep throws. On deep outs Clausen will take some zip off the ball and not deliver it as quickly. It will also take him a while to get deep passes out as he has to rely on his body to get the ball out. His arm will never be confused for Joe Flacco's or Matt Stafford's, but it's every bit as strong as Mark Sanchez's. Athleticism/mobility: Clausen has good quickness in the pocket to slip around rushers and get rid of the ball. When he's on the move, Clausen needs to do a better job of securing the ball while he's on the move. Players at the next level will be more capable of stripping the ball away. Won't make a lot of deep runs in the open field. Runs mostly erect. Decision making: Rarely will you see Clausen throw into bad coverage situations. Even when he does, he tends to put the ball only where his receiver can catch it. Intelligently throws away passes instead of passing into coverage or taking a sack. Field vision: Works through his progressions better than just about any quarterback in college football. This is a display of his excellent football intelligence. When Clausen's first two reads are unavailable, he frequently found tight end Kyle Rudolph or checked off to a running back. As a junior, Clausen really improved his ability to move safeties with his eyes. Mechanics: Possesses a quick, smooth delivery. Has a slight windup, but it's very correctable. Looks to have great balance and control driving back from under center. Quickly gets his feet into position. Clearly most comfortable in five-step drops. Where Clausen could improve is planting his feet in the ground. He'll frequently shuffle his feet in the pocket. Pocket awareness/poise: Clausen is generally calm and poised in the pocket, but he'll often get antsy and start shuffling his feet around. This was especially evident following a mid-season foot injury. Loses some steam on his passes in the face of pressure when he tries to get rid of the ball more quickly. Final word: After Notre Dame fired head coach Charlie Weis, there was no reason for Clausen to return to school. Playing for a new coach, Clausen's pro potential could have only struggled by switching offensive systems. He also would have risked injury. Where Clausen showed the most intangible improvement during his career was in his leadership ability. After looking somewhat tentative early in his career, Clausen was clearly an on-field leader for the Irish. He has no known character flaws. Clausen will go into the 2010 NFL Draft as a probable top 10 selection and could be the first quarterback selected. He improved leaps and bounds at South Bend after starting out as an inconsistent 190-pound freshman. 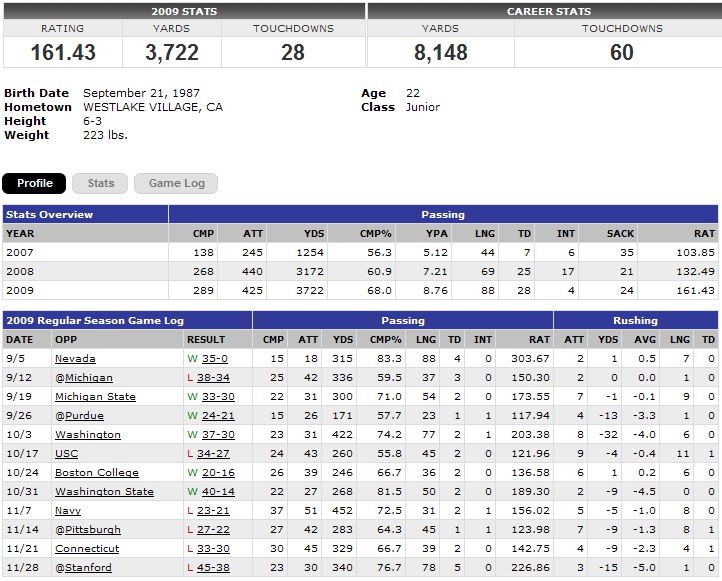 He's an incredibly accurate passer and finished 2009 with a stunning 28:4 touchdown-to-interception ratio. Summary: Jimmy Clausen is a franchise quarterback. He has carried the spotlight since he was a teenager and has surpassed the hype. He has an outstanding skill set with the elite intangibles you see in the great quarterbacks. Clausen isn't fazed by tense situations and has great leadership when the game is on the line. He puts in the hours to be a great quarterback and you see it on tape. Clausen will likely be the first quarterback drafted and is a projected top-five draft pick. Player Comparison: Kurt Warner. Warner and Clausen both exhibit the same three-quarter release, they get the ball out quickly, and are extremely decisive/intelligent quarterbacks. Clausen has a stronger arm. Accuracy: Clausen is the most accurate QB in this year’s class. He is a tremendously polished QB who does not miss receivers. Has the ability to put it anywhere it needs to be. Leads his receivers well. Not afraid to throw into a tight window. Arm Strength: Clausen’s arm is well above average though it is not elite. Does posses the ability to make all the throws. Short and intermediate routes have great zip on them and get on the receiver in a hurry. Deep ball has a tendency to float at times, but he does have the power to get it 65-70 yards downfield. Decision Making: Has matured greatly in his decision making. Very seldom tries to force a throw that isn’t there. Needs to make his reads faster post snap. Reads the coverage well pre-snap to identify his primary route. Has a great feel for where to throw. Very adept at when to throw the ball away. Field Vision: Clausen makes his own reads pre-snap and identifies the coverages at the line, a rarity in today’s college game. He sees the field well and easily identifies when to take his check down receiver. Does not miss a receiver breaking open. Mechanics: Clausen is very technically and fundamentally sound. Posses a short, compact release that gets the ball out of his hand in a hurry. Throwing motion fluid and releases the ball high, preventing batted balls. Very sound and fluid in his drop backs. Mobility: Clausen will never be confused for a running QB. Foot speed is well below average. Does possess a good ability to escape the rush and move in the pocket but is not a threat to run for any big gains. Solid at throwing on the run. Pocket Awareness: Perhaps the biggest improvement Clausen has made in his time at Notre Dame is his ability to feel the rush. Moves well in the pocket and understands when it is time to take off. Good at avoiding the rush and still getting the throw off. Not afraid to stand in and take the hit to make the play. Agility: Solid lateral agility while moving in the pocket for a QB that is not a running threat. Not a danger to make anyone miss in the open field, but uses what he has well in sliding in the pocket and moving side to side to make a throw. Final Word: Clausen is a big game QB with a ton of moxie and confidence. His ability to lead late game comebacks and his calmness under fire will excite a lot of NFL teams. He may not be a naturally vocal leader, but his toughness and willingness to play through injuries will earn him the respect of his teammates. He possesses an NFL and elite accuracy that could make him a multiple Pro Bowl player in the NFL if he is allowed to develop slowly and learn in his first few NFL seasons. Overview: Jimmy Clausen is widely regarded as one of the two best quarterbacks in the 2010 draft class. He worked out of a pro offense at Notre Dame, playing in an offense that scored a lot of points (and for a team that lost a lot of games). His leadership and ability to win have been called into question on numerous occasions, and those two factors are arguably the biggest things holding him back. Expect to see Clausen be taken in the top 10-15, but certain team needs may dictate him getting drafted even higher. Pros: Has the arm strength to make all NFL throws … very accurate passer … excellent mechanics … very good pocket passer … very knowledgeable quarterback … has an excellent background, having played in an NFL offense under Charlie Weis … led a very successful offense at Notre Dame … very complete quarterback. Cons: Questions concerning his leadership and personality are rampant … Notre Dame was relatively unsuccessful as a whole during his run … wasn’t great in terms of consistency. Jimmy Clausen doesn't jump off the screen. His passes don't sizzle like Elways, his legs don't bring me out of my chair like Vick's, his accuracy doesn't conjure Aikman, his read-and-release time doesn't dazzle me like Brees. Physically I have no doubt Clausen can succeed in the NFL. He has the arm strength, touch and what appears to be anticipation/timing with his receivers. He has enough pocket awareness and quicks to help out his offensive line when the pass protection breaks down. He throws naturally and with accuracy on the run. What it will come down to is whether or not he can take those attributes to the NFL field with him. Many college hotshots can not; the game proves simply too fast and too complex for them. So for me it comes down to what is in his head and heart. Work habits, natural leadership ability, toughness ... professionalism. If Mike Shanahan and Bruce Allen conclude, after studying hours of film on Clausen, conducting exhaustive interviews with those who have known and coached him, and sat across a table looking him in the eye and taking the measure of the man, that Clause is worthy of the calculated gamble that is drafting a quarterback high in the first round ... I will have no complaints. The man looks like an NFL quarterback.